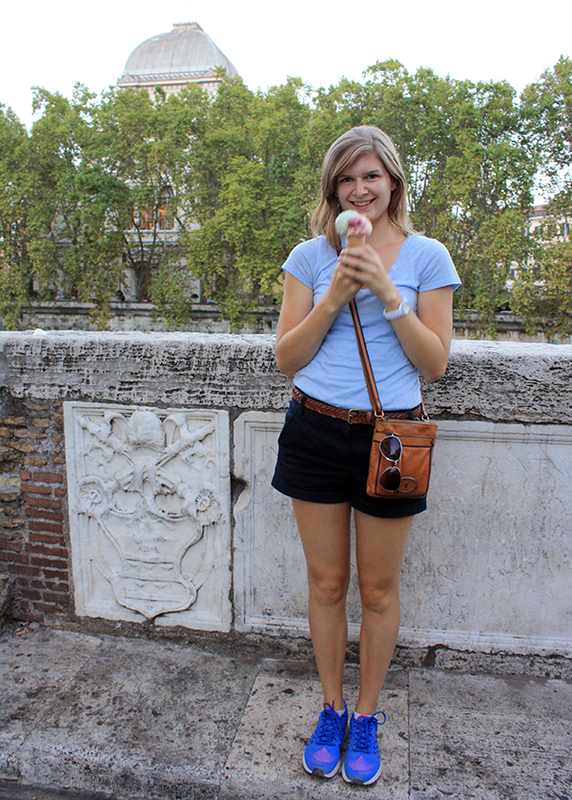 This is the final installment in the recap of my recent trip to Europe. I had such an incredible time and can’t wait to go overseas again in the (hopefully) near future. Also read about my time in Barcelona (Part 1 and Part 2) and Florence (Part 1 and Part 1). We parted ways with Lauren at the Santa Maria Novella station (after one final Florentine breakfast), and Aaron and I continued our journey solo to Rome. The high speed train into the city took about an hour and a half, so we arrived just after noon. A short cab ride later and we arrived at our hotel. The visit to Rome ended up being more of a pleasant side trip than an intentional decision, but I’m so glad that we spent at least a small amount of time there! It was much cheaper to fly out of Rome than Florence (I’m still amazed that our multi-city tickets only cost $1200 each in total), so since we would need to be there to fly out the next morning anyway, we figured we might as well get there a day early. 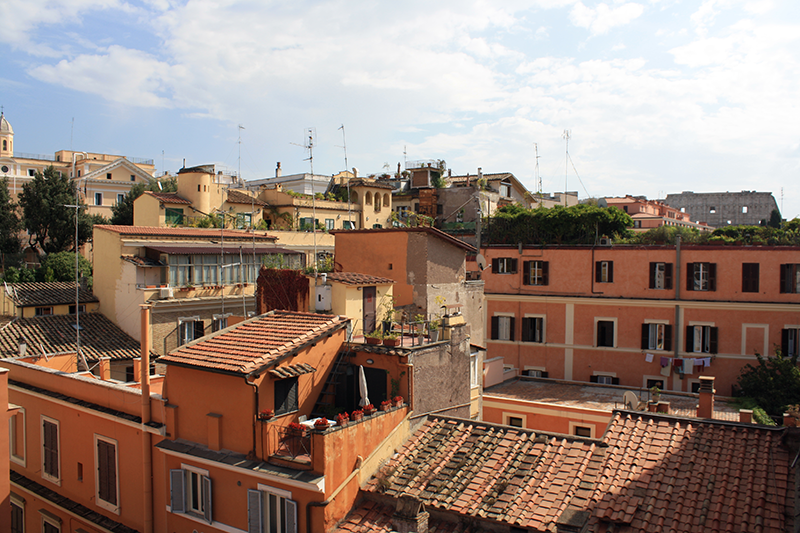 We didn’t spend much time in the hotel (less than 24 hours in Rome, so little time, so much to do), but we did stop to enjoy this incredible view from the rooftop terrace. Over on the far right you can just see the Colosseum peeking out! Holy cow, how amazing/incredible/all-the-descriptive-words is this? 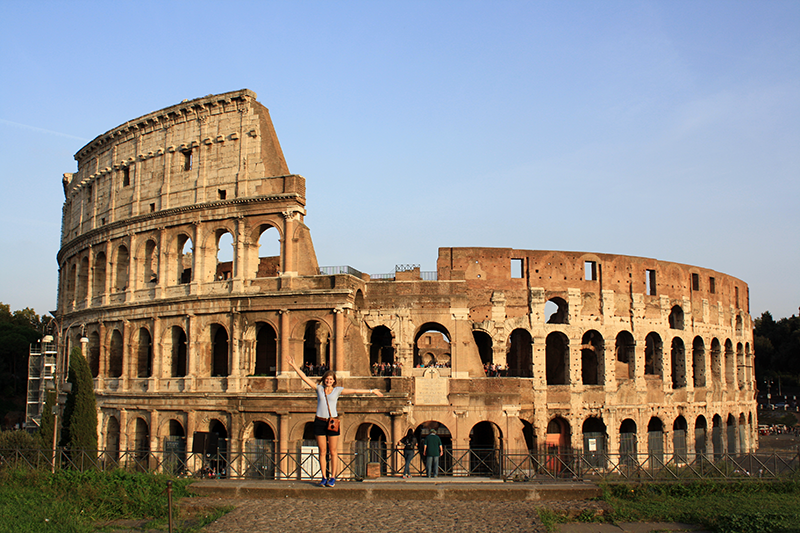 The Colosseum was built around 80 AD to showcase Gladiator fights and games that would take place over many days. Think Olympics, but with people being killed for entertainment. Umm so yeah maybe that part isn’t so cool. I read one snarky sign that mentioned Christianity had started to spread through Italy around the end of the Colosseum’s reign of terror, and that it could be inferred that the increased sense of morality thanks to a new found religious belief might have led to the games being called off… but not actually. Turns out that isn’t the case at all, they had just run out of money to sponsor them. Violence of the games aside, stepping inside these ancient buildings was so cool. It’s hard to fathom that something so old could have stood the test of time for this long–not that they haven’t had their share of troubles of course. I learned that while a lot of the damage to the Colosseum has been caused by natural disasters (probably an earthquake or two), more interestingly much of the stone and marble were pilfered by thiefs and used for other construction projects, including new buildings in Rome. After the Colosseum, we stopped for lunch at a cafe, where we ordered a pizza and an avocado salad to share. The best part of where we stayed in Rome was the proximity to the ruins, so after a short stop back at our room and a loop around the perimeter of the Forum and Palatine Hill, we entered the grounds to explore. To be perfectly honest, I don’t really remember learning much about Roman history in school, and I also didn’t do my homework before we got there. So I wasn’t very familiar with what all we’d be seeing when we visited the Forum/Palatine Hill (which are connected together and all on one entrance ticket). Palatine Hill was home to many nobility back in the day of the Roman empire, and while many of the structures have worn away over the years, it’s still clear that these were very magnificent buildings. 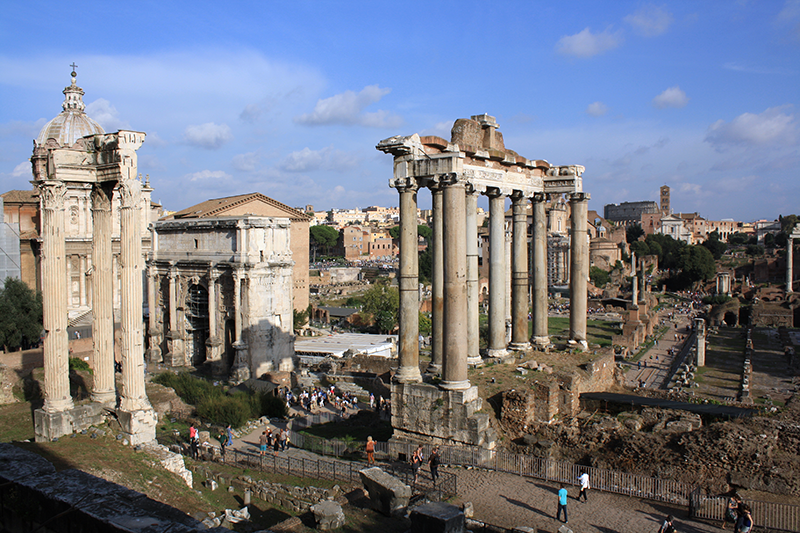 The Palatine overlooks the Forum, which was a central space where Roman citizens gathered to do business, practice their religion, and socialize. I like to think about it kind of like the Madison farmer’s market: situated around the capitol building, people visit from near and far to purchase food and other goods and to enjoy others’ company. 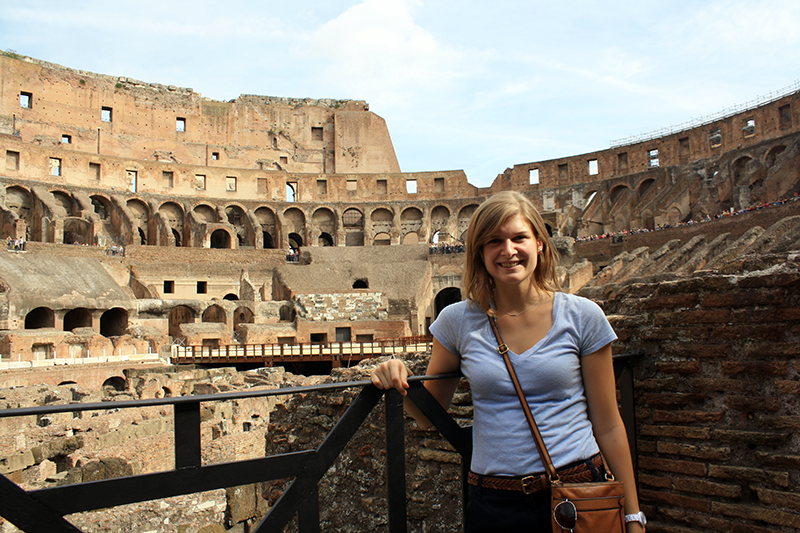 Quick photo op in front of the Colosseum (this was taken from inside the Forum grounds). 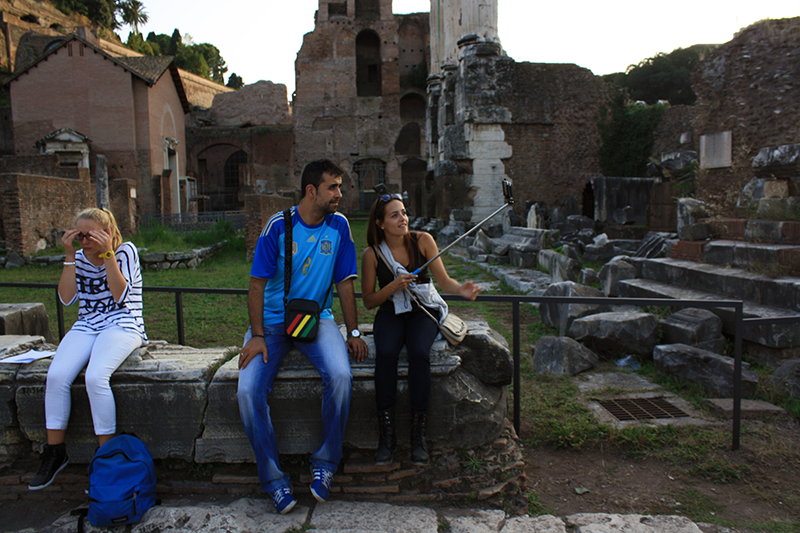 Our trip could not be complete without capturing a photo of the nonsensical selfie stick in action. Have you ever seen one of these before? You attach your phone/camera to the end of the stick, hold it out in front of you, and use a remote to (theoretically) capture a good photo (I saw a heck of a lot of selfie sticks pointed directly at the ground). We saw these being used all over Italy, and had too many offers to purchase one to count. You know those people who sell pictures or scarves or hats on the sidewalks in heavily touristy areas? Apparently the things to sell now are selfie sticks. So I digress… but seriously, these things are so silly. Sadly we didn’t have time to check out some of the other points of interest in Rome (doing it again I would’ve liked to visit the Spanish Steps and the Pantheon), but instead we wandered over to the river as the sun started to set. One final stop for gelato. This guy had scoops of a lemon basil and a fruit salad flavor. Especially delicious because these weren’t just flavorings, there was actually basil and actually chunks of fruit mixed in there. Pooped out from another long day of walking, and needing to be up in the morning to get to the airport, we opted to grab food to go from a pizzeria/deli and ate it in our hotel room. My final Italian meal was so satisfying! Similar to the crusty sandwich I had at the Mercato Centrale in Florence our first morning there, this one was piled with spinach, prosciutto, thinly sliced mozzarella, and (the best part) a creamy cheese spread (that maybe could have been ricotta?). Another food I must recreate! And that was our trip! We took a cab to the airport the next morning, caught our flight to Dublin with plenty of time to spare, and then flew on back to Chicago from there. Hope you’ve enjoyed reading my travel log as much as I did writing it and remembering all the things we did.